Unfortunately, there are not 10 magical slides that you can fill in and have a complete pitch deck. If there were, every investor presentation deck would look the same, and investors would be bored to death. So instead, here’s a more hands-on approach to building your pitch deck—including guidance on how to build your investor presentation deck, and that developing the content that you’re going to need to do so. But first, a note on those “Top 10 Slides You Need” articles. In some ways, these articles are not wrong. They’re just too simplistic. There are some key pieces of information that you’ll need to cover with your investor presentation. These lists are a good place to start thinking about what goes into your pitch. They’re just not enough to get you the rest of the way there. Look at it this way: every story has a beginning, middle, and end, but to write a really great novel you need so much more. A pitch deck is the same way. To be really effective, you need to think bigger, broader—and better. If you use a list of “top pitch deck slides,” you’ll get a presentation that checks all the boxes, but it won’t wow your potential investors. And with the limited time you have in front of them, you really do want to wow them. What will impress your investors? A compelling story about your company, this deal, and why you are a good investment. When you start to gather information for each of these “top 10 slides,” consider how your story fits, but also how it breaks this mold. Know that you may have more than one of the “slides” you need, and you may skip some altogether because they don’t fit a company at your stage. And, you’ll have awesome pieces of information, that will not be covered by these lists, but you should definitely include. Like a patent, or key partnerships. How you talk about your company in your investor presentation deck will always change the amount of slides and key concepts included. It’s really not a one-size-fits-all approach if you’re doing it correctly. I recently read INC’s article “Pitching an Investor? This Is Exactly How Many Slides You Should Have in Your Pitch Deck.” Ironically, it doesn’t actually say you should have only the slides they list—just that the listed slides are the ones the author used in his pitches in the past. Check out the video at the end of the post for some investor insight into the pitch, and why it’s easy for founders to get caught up in the creation and lose sight of the big picture. I propose the reason people get caught up in the formulaic approach is because of the plethora of articles like this one, that list the definitive 10 or 12 slides you “need” in your pitch deck. These articles are everywhere! But like everything in your startup, the investor presentation deck creation process is not easy, so don’t expect a walk in the park. Below, as outlined in the Inc article, are the slides that everyone seems to agree on. But remember that in a good pitch deck, we’re not necessarily creating a slide for each of these, but rather seeing them as pieces of information that we need to cover. A good pitch deck designer will ensure that you give investors the information that hits the high notes. With that, let’s dive in to Inc’s recent article. Slide 1: Make your statement of purpose. They’re right; you need a polished story. But knowing you need that and actually getting it are two different things. Most of the challenges in telling your story have to do with being too close to the product or service to really be able to talk about it properly. Why you are doing business is probably too complex to describe concisely, not to mention how the customers fit in and what you do for them. There is usually a ton to unpack, even with simple concepts. Get your purpose down to this: How are you changing the space you’re playing in for the better? What’s the underlying “why” behind the product and company? At Pitch Deck Fire, our main approach to this story actually doesn’t start with the founders at all. The “why” and the customer are so inherently linked that we want them to become their customer, and then tell us why they are doing it. Get clear on “why” in reference to the actual product you are selling and company you are building. Telling your story in relation to a glaring, painful problem is the key. The reason for your customers to care is also the reason for your investors to care. This might be only one slide, or it might not. Maybe it’s part of the title slide and maybe it’s not. But it is a good way to launch into a pitch. Slide 2: Introduce your team. First of all, I’m surprised to see this as the second slide. Are they trying to say this is the ideal order, or the priorities in the content? I’m not sure. What I do know is that not every team has the most stellar lineup (or traditionally impressive backgrounds) to constitute a “front and center” team slide. Also, your background is less impressive without the context of what type of business this is and what skill sets are needed to succeed. So let’s assume this isn’t the prescribed order for all pitch decks, that you may well have other slides (like problem/solution) before this one, and that later in the deck we will get to the team slide. The best startup teams are diverse, with cross-functional experience outside the founder’s comfort area. Investors want the team to demonstrate less risk, more competence, and an overall synergy of working together over the startup life of the company. Teams with similar experiences or homogenous work-life backgrounds will have a greater chance of failure and therefore present more risk to the overall investment in your company. So make sure the team slide really reflects who you are, your experience and how it all fits into the overall picture, responsibility areas, and possibly even your plan to build the team into the future. This will probably only take one slide, but it can be two, depending on the size of the team, the value and size of the advisory board, and other factors. Slide 3: Identify the problem. Yes, we need to discuss the pain points your customers face. It’s how we lay the foundation for an objective agreement on the need for our solution. Otherwise, we’re just creating products that no one wants and therefore no one will buy. The old adage “If you build it, they will come” simply does not stand. “Necessity is the mother of invention” is more appropriate. I completely agree that investors want to solve real problems. If only because a real problem means real customers, which means real money. But it has to be tied to that money side of the equation. Investors are not philanthropists. A real problem might be world hunger, but unless you’re going to make money solving it, that problem will not in and of itself be compelling to investors. Slide 4: Present your solution. This is another slide commonly recommended in all of these lists. Here I recommend focusing first on the true benefit that your customer is getting, and then broadening out to the features and product functionality that will provide this benefit. I often see founders muddling this up with the value proposition. Especially for more complicated, multi-sided, platform-based models, the solution can be unclear. So keep it simple for the person who has never seen your product in action. This can be hard to do without an outside perspective. You’ve been “in it” so much, making code changes at 2am, it’s easy to get lost in the nitty gritty of how it works, and not think about how it benefits your customers. This can be a compelling slide for many companies. But for many others, the need just isn’t there. You can’t make this one up. If there are no big, relevant changes in the world that create a confluence of factors making this the right time for your company or concept to flourish, then don’t force it. Some companies are improving on other models, and don’t have clear technological or market forces causing gaps in the market for them to fill. If you’ve got it, flaunt it! But if not, don’t try to force it; it will only highlight an area where you’re lacking. Slide 6: Explain how this will work. As mentioned before, this should tie in with the problem statement. In my professional opinion, this slide should also connect with the market sizing and the traction seen thus far, both of which are pieces of information left out in this list but included in others. They are all tied together to help build out the storyline of the financial side of your pitch. The problem and solution are “softer,” but they build to your business model, the size of the opportunity (number of people you can sell those revenue streams to) and the traction you’ve seen (the number of people you’ve already sold to, or validated that you can sell to). They are inextricably linked. Slide 7: Spell out how your business will perform for the next five years. Depending on the stage your company is in, your projections will be more or less clear. And therefore, while you need to have projections and plans for your businesses growth, some decks for early-stage companies leave this information out. Now if you’re pitching to venture capitalists, you’d better have your ducks in a row when it comes to financial projections and expected ROI. But for early-stage companies, it is somewhat universally agreed that financial projections are made up anyway, so you may or may not want to include these in your pitch deck. Especially if you haven’t landed on a clear business model. How can you project your revenues if you don’t know what you’re charging to who, for what? Without this, you’re just making up numbers. Slide: 8: Show your investors how they’ll 10x. I disagree that this should be a slide. This is (as it seems to be explained in the article, anyways) a culmination of many parts of your pitch. The overall message should lead to the investors’ conclusion that they will get a high ROI. You may not be able (or need) to spell this out by the year/ROI%, or expected timeframe. But you should absolutely be framing everything you share throughout your pitch around that message. Investors are, after all, in it for the money. Maybe they’re in it also for about 10% bragging rights, and 2% altruism—but the other 88% is for the money. You need to build a compelling ROI case from the very beginning of the pitch. Don’t wait till the end! Regardless of the exact slides you choose to use, the main message here is that your deck needs to be concise, tell your story quickly, and capture investors’ attention. This is the ultimate goal. When creating a pitch deck (either on your own or with pitch experts), throughout the process you’ll learn more about how to tell your story the right way, and how to get investors interested. Why are you doing this deck in the first place? This is your first chance to build solid marketing collateral for your business. The way you pitch to investors and the way you talk to your customers is very similar. We want to make sure that you have your message down before you talk to external stakeholders—whether they be potential investors, mentors, partners, team members, or customers. Ok, so you won’t use those exact slides. But how do you decide what slides to include in your investor presentation deck? In other words, should your “problem” section take up one slide, or three? How many customer groups to you have? How do you explain their challenges and pain points? Why do they pay you? And don’t forget to think about how you’re presenting this. The design and content support each other in every piece of collateral, so how will you effectively convey the information you need to convey? This can also determine the number of slides covering a specific topic and how to approach it. At Pitch Deck Fire, we can estimate how many slides a client will need to tell their story, but it is never the same from client to client. On average, our decks range from ten to 25 slides. There are a lot of factors to consider. Add to that the intricacy of adding multiple uses for your collateral and collateral needs, and it’s pretty impossible to give a one-size-fits-all solution across all channels. This is one of the reasons you should work with a holistically-focused pitch deck designer that can take your company all the way from the investor presentation deck, to the sales/client-facing visual documents, to the print and digital marketing collateral. They should all connect. The investor and client-facing communications relate and translate naturally to each other. If you have designers that know business and keep you focused on telling your story to a customer audience, you’ll be able to make a more compelling case to investors in the end. So sure, take a look at those “top slides” articles, but if you want a truly effective deck for your company, you’ll need to break those molds.  If you have any issues doing so, or want to get a better deck, faster, work with a pitch deck expert like Pitch Deck Fire to build your best investor presentation deck.